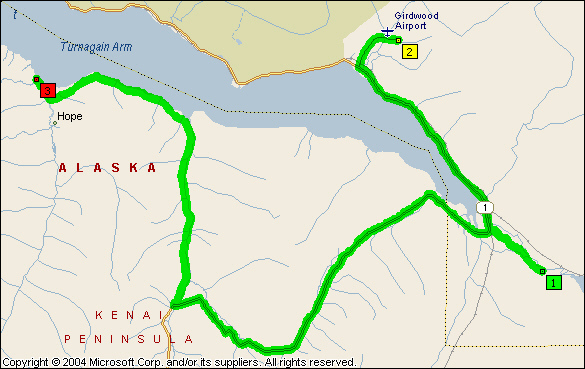 A smaller map does not show the Portage-Glacier Road and none show the tunnel through to Whittier! 5,087.9 9:17 Leave camp ... breakfast - hot oatmeal cereal and apple butter on toast. 9:18 Stopping to drop off garbage. I am thinking of my grandson today - I was in Vancover two years ago and we were celebrating the birth of a darling baby boy, a boy who seemed to be perfect and developing normally until about three months old when he started having seizures. 9:20 Entering the Portage-Glacier Road and turning east. 9:22 Through the small tunnel. 9:23 Stopped (Time: 9:19:56) to pay the $12.00 (return) toll to use the Anton Anderson Memorial Tunnel, a railway tunnel built in 1941 ... see MP p. 532 for information about the tunnel and access to Whittier. 9:26 Paying the toll and proceeding to Lane 1 - like taking a ferry! ... a big cruise ship is in port. We drove around the town, then parked while we walked along the waterfront. ... waterfalls ... Jo says the change in three years is appalling ... large apartment block which contains everything - store, school, library and housing. 10:52 Leaving from where we parked and heading back towards the tunnel. 10:58 Sign: Whittier 1 mile, Portage 9. 11:00 In line for the tunnel. 11:05 Starting up on time. 11:06 Entering the tunnel ... WATCH FOR ROCKS next 2½ miles ... there are safety shelters in case of fire in the tunnel ... Safe House # 1, etc - Emergency. 11:13 Leaving the tunnel ... metered on 15 minutes to get through. Sam insists there must be no more than 10 wows, 10 unbelievables, 10 fantastics, 10 amazings, 10 awesomes/day! 11:16 Turning into Portage Visitor Center. 11:18 - 12:53 Begich and Boggs Visitor Center (Movie $1.50 - ½ price for 3). 12:55 - 1:12 Gift Store (Ulu cook books - M/C - $11.96). 1:18 - 1:49 Back at camp for lunch - ham and cheese sandwich and a banana. 1:54 Turning left on Portage-Glacier Road. 1:59 Sign: THANK YOU FOR VISITING PORTAGE VALLEY. 2:01 Junction with the Seward Highway and turning right ... passing dead trees from the 1964 earthquake. 2:03 Old buildings from the ‘quake . 2:05 One waterfall after another ... we are driving back along the road towards Anchorage. 2:12 Three glaciers to the right. 2:13 Turning off to the right to Girdwood and Alyeska. 2:18 - 2:54 Kobuk Valley Jade Company ($12.00 cash for jade cubes, M/C $15.00 bracelet for daughter in law Holly). I enjoyed walking around outside looking at the beautiful flowers, wildflowers in the garden bed and hanging baskets with begonias on the building. At the front of the store there is a wall of large blocks of jade of various colors. Inside the shop was a beautiful piece of wood carving and we were also able to look into the workroom where the jade is cut. 2:55 As we continued up the valley there were a lot of artists, some standing and some sitting, all painting the magnificent scenery. 2:57 - 3:20 Wandering through and around Alyeska Prince Hotel, a beautiful building at the foot of the Alyeska Tramway ... sometime I hope to have the chance to ride it! 3:24 Passing the jade Shop ... some pretty nice “shacks” in the vicinity along the Alyeska Highway, some of them log ones on stone foundations. 3:28 Back over Glacier Creek and turning right into Girdwood. 3:30 Turned around at the Elementary/Junior High School. 3:33 Back at Alyeska highway ... passing roads of to the right to Hottentot Mine and Gunnysack Mine. 3:36 Junction with and going north on Seward Highway. 3:37 Leaving the flat valley and driving along Turnagain Arm with the railway line between us and the mountains ... high steep slopes and waterfalls at various points - amazing - all along, waterfalls over rocky cliffs just one after another ... there are a few trees going up the slope, then shrubs, then mostly rocks with some snow patches. 3:43 Turning into Bird Point (A 30.5 - p. 524) - but this was a fee area, so we returned to the highway and went south ... we were looking for a good vantage point to watch the bore of the incoming tide along Turnagain Arm. 3:48 - 4:15 The tidal bore was not particularly high, so hardly spectacular (not like I had seen at Moncton on the Bay of Fundy in New Brunswick), but we did see it ... saw an eagle fly over whilst we were waiting. 4:17 - 4:27 Stopped at the next pulloff south ... lots of signs including many about belugas ... it was exciting to see the tidal bore ... the mud flats are dangerous and can be like quicksand - there are rescue teams to help save careless people! 4:31 An eagle sitting on the mud flat. MP p. 531 - Information about baby animals being rescued. 4:45 Pictures of all that is left today of Portage as a result of the ‘64 earthquake. 4:46 Crossing Portage Creek # 2 - tidal. Crossing Portage Creek # 1 - tidal. Swamp to the right as we pass the turnoff for Portage-Glacier Road to the left. 4:47 Crossing Placer River (tidal) as the highway turns west. 4:48 Seward 76 miles, Homer 172. Flat area at the top of Turnagain Arm, marsh and ponds with yellow pond lilies ... tundra swan ... we are driving northwest on the other side of Turnagain Arm. 4:50 Turning west again and crossing Ingram Creek ... lovely sign: WELCOME TO KENAI PENINSULA ... and the road is climbing. We are seeing much larger spruce trees, maybe Sitka Spruce. 4:53 Work Zone - begin double fine traffic zone ... the road is up and down going through a valley in the mountains. 4:57 Divided highway starts ... Turnagain Pass ... Rest Areas both sides. 4:58 End of divided highway. 5:04 Crossing East Fork Sixmile Creek ... Hope Road junction 5 miles. 5:05 Snow in ravine with a hole underneath the snow where the water is running out ... walking/bicycle path to the right of the road. 5:08 Hope junction 1 mile. 5:09 Canyon at the side of the road with Sixmile Creek flowing through it. 5:09 Turning off for Hope ... 18 miles ... the road, sort of paved, is narrower than the main highway and is rough in spots, lots of spots! Turnagain Arm is on the other side of the mountains from this road at present. 5:15 Snow below the road and on the other side of the creek you can see the remains from avalanches ... a lot of dead trees from the spruce beetle. 5:20 Can see deep down to the creek below. 5:21 An area to the right where logging is being done. 5:23 Passing rafting and sea kayaking ... also the start of some houses interspersed along both sides of the road. 5:29 Starting to see Turnagain Arm again ... 45 miles as the crow flies to Anchorage, or even less, but 90 miles by road. 5:30 Glimpses across Turnagain Arm. 5:31 Looking through large spruce trees to Turnagain Arm .. Tide still coming in ... can still see the mud flats. 5:34 Brief view of mud flats. 5:36 Logging to the left of the road. 5:37 - 5:53 Stopped for roadwork. 5:55 Passing numerous buildings, lodge, motel. 5:58 Welcome to Hope - MP pp. 538-539. 6:00 Hope Post Office, Alaska 99605 ... opposite Hope and Sunrise Historical Society. 6:02 First live TV in Alaska ... picture of the house where Sam and Jo watched the landing on the moon in July 1969. 6:06 Two pictures near the water ... raspberry patch to the left. 6:12 Leaving after a number of pictures towards Anchorage and across Turnagain Arm, also fast flowing Resurrection Creek. 6:16 2 pictures of Sam’s bridge over Resurrection Creek. The replacement bridge over Resurrection Creek was Sam’s first project as a project engineer. 6:24 End of roadwork and entering Porcupine Campground. 6:25 - 6:35 Pit stop and 2 pictures across Turnagain. 6:37 Still in the campground but away from the water ... big trees. 6:38 Roadwork next 18 miles as we leave the campground. 6:42 Pictures of Sam’s bridge. 6:48 Leaving after another stop for roadwork following a pilot car. 6:52 Lots of dead spruce going up the hillside to the right - big dead trees ... devil’s club has huge leaves. 6:58 The tide is well in now. Their first child was born the second year and he slept in the bottom drawer of a chest of drawers until they bought for $5.00 a port-a-crib which folded up. This same port-a-crib went through three children! Where there is a rock cutting, even a small one, I can see moss and just what a thin layer of soil there is in which plants and trees can grow! 7:22 The rock looks to be shale at that particular point! 7:25 End of roadwork and back on the Seward highway. 7:26 Big bridge over Canyon Creek - cal also see an old bridge below the new one. 7:30 Crossing East Fork Sixmile Creek ... the mountain ahead and now to the right looks like a cirque. 7:38 At this point there is a tremendous amount of snow on the mountains ahead of us. 7:39 Long descent ... going out along the highway I knew we were ascending, but didn’t realize we had gone up so much ... the snowy mountains are straight ahead. 7:42 A curve, but still going down, then another curve, and now Turnagain Arm is ahead. 7:44 4 miles to Portage junction. 7:45 - 7:46 Yellow pond lilies and grasses, also seagulls perched in dead trees. 7:48 Turning off Seward Highway onto Portage-Glacier Road. 5,241.9 7:55 “Home” ... end of the day. Supper - chicken (canned) with Chicken Helper Fettuccini, salad of lettuce, green pepper, tomato and guacamole chips. We had the dishes done and were all cleaned up by 9:30, the sun still shining down on us. We set out for a walk along the boardwalk by the creek, one of Jo’s walks! But we turned around before going too far! 10:44 Leaving Camp to drive to the Williwaw Viewing Area. 10:48 - 11:00 Williwaw Salmon Interpretive markers. On leaving we turned towards the highway in the hope of seeing a great sunset across Turnagain Arm. 11:09 The sunset had faded too much so we turned around at the highway. 5,251.6 11:19 Back at camp ... REAL end of the day! 5,251.6 9:31 Leave camp ... this was a particularly nice campsite and I was excited about the fact of camping below a glacier (Middle Glacier). Packing up was much easier this morning having everything dry ... up at 7 o’clock - one of our colder mornings and the mosquitoes were bad AGAIN! We had our standard breakfast of cereal and toast ... Sam’s coffee was really good, and Jo deserves some of the compliments - she found and bought the coffee pot. 9:47 Arriving at and turning left (south) on the Seward Highway (AK-1). 9:48 Crossing the Placer River and a little further along the Placer river Overflow. 9:51 Crossing Ingram Creek and “Welcome to Alaska’s Kenai Peninsula” then starting the climb into the mountains. This is the same route we took yesterday afternoon when going to Hope. 9:52 Fissile shale cliffs on the right whilst stopped for road construction ... the shale is standing on end and gold will drop down between the sheets of stone creating a natural sluice box. Shale is considered a fissile rock because it splits very naturally along its layers. 9:55 Starting to move forward (I took pictures of glacier in the sun just before leaving). 9:57 A profusion of daisies along the road ... a glorious morning with the sun shining and mountains reflected in still waters. 10:04 A carpet of gold, I think probably Alaska poppies - just guessing as we drive past. 10:12 Crossing Canyon Creek and passing the turnoff for Hope. Seward 54 miles, Homer 150 miles. 10:15 Long tongues of snow to the left reaching well down into the valley. 10:19 Wild geraniums along the road. 10:21 Passing Lower Summit Lake. 10:22 Passing Summit Lake lodge. 10:24 Road closure gates - southbound avalanche gates. 10:28 Another set of closure gates - northbound avalanche gates. 10:30 Lake (Tern Lake) at the side of the road ... southbound exit for Sterling Highway (AK-1) west whilst the Seward Highway (AK-9) goes south from here. Smokey Bear sign showing “HIGH” fire danger. We are now on the opposite side of the mountains from when we went to Hope, the south side, and there is not a lot of snow. 10:39 Entering Cooper landing and Kenai Lake (large) to the left - a big lake as we drive west along it, the road winding around, up and down around mountains ... sometimes trees block the view. 10:42 Still by the lake. 10:43 Crossing the Kenai river which is at the end of the lake ... lodges, cabins, motels, stores ... Cooper Landing has long been a summer resort. 10:45 Rapids in the water - rafters out on the water, also catamaran-type canoes ... fishing, rafting. 10:46 Kenai is a big river and is right at the side of the road at this point - beautiful color. 10:49 Sign: “The reds are in” ... fishing trips ... fish freezing ... rentals ... lodges. 10:50 Crossing Kenai River and Resurrection Pass trail. 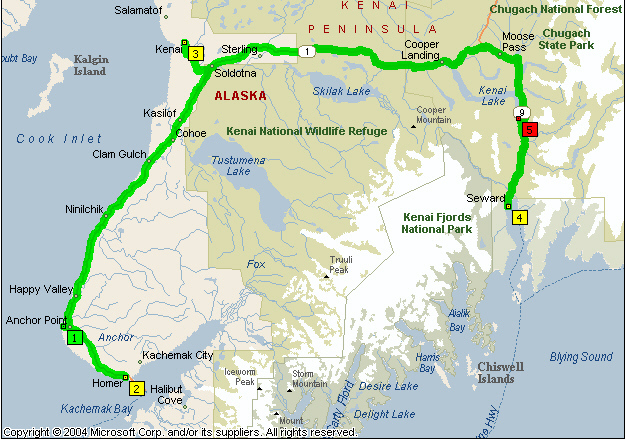 10:51 Mile S 53.8 (p. 575) - Soldotna 41 miles, Kenai 47 miles, Homer 115 miles. 10:52 Kenai Russian River Ferry ... campers - too many to count ... dozens of people in waders in the river fishing - MP p. 574 (Fishing the Upper Kenai River). 10:53 - 11:07 Stopped for pictures of fishermen and we walked down a trail through scrub to the river bank. Sam says, “Fishermen can be cheek to jowl”. 11:11 Skilak Lake to the left ... for the most part the mountains around us are devoid of snow ... trees go up so far, then rocky. Back at camp we were talking to a man who had not been to Alaska before and he said that he was disappointed in what he was seeing in Alaska after having seen the Canadian Rockies. I am not disappointed about anything and am enthralled by everything. I just want to come back again! 11:19 Heading due west, a long straight stretch, snow-covered peaks in the distance. 11:23 Trees both sides of the road are so close it is like a thicket. 11:24 A muskeg area ... mountains back over to the left in the distance are higher and have some snow on them ... the land to the right is also marshy. 11:26 Crossing East Fork Moose River ... slough to the right ... it is amazing just how much does grow in the muskeg ... the valiant effort made by trees is fascinating! 11:30 Sign: Hospital 20 miles. 11:35 Entering Sterling ... daisies flowering ... all sorts of businesses. 11:37 Crossing Moose River ... 72°. 11:39 Divided highway ends ... Sterling is really strung out. School ... sign: “Report cards mailed 05/27" - they can’t be intercepted by the kids because parents know when to expect them! 11:42 Subdivisions ... roads going off to the left and right ... lakes ... lodges ... homes ... mailboxes. 11:44 Stopped for roadwork near Alaska Horn and Antler Store ... time to ask Sam about his work in Alaska! 11:50 Starting to move off ... more names for different lakes which we can’t see ... continuing to pass residential areas and businesses. NOTE: When Sam worked in Alaska his first position was with the design office working on construction; his second posting was with Federal Aid - review plans, take leave, sit around and shoot the bull, go hunting - the difference between summer and winter. 11:54 Crest ... and the snowy mountains ahead are on the other side of Cook Inlet ... passing Hanson’s Custom Carvings. 11:55 Soldotna City Limit, pop. 4,059 (pop. Kenai Peninsula Borough 49,691), El. 115 feet - MP p. 583 ... a very busy place - Fred Meyer, Safeway, Wells Fargo ... road construction on the bridge across the Kenai River which flows through the city. 11:59 Turning around to return to gas station we had seen on the way into town, one which showed the price of gas as $2.209. 12:04 Turning back ... when we got there it was to find out the pumps were out of order! 12:05 Soldotna City Limit again! 12:07 A lake to the right - I did not see it before. 12:08 Turning into Fred Meyer. 12:17 - 1:00 Fred Meyer grocery shopping - food $24.19, beer $7.13, wine $6.29. 1:07 Slow on the bridge over the Kenai River because of construction. 1:08 Turned right into the Soldotna Visitor Center. 1:09 - 1:59 Visitor Center ... we made use of a picnic table under a tree to have our lunch, then took the wooden staircase of the interesting Fish Walk, which has interpretive markers all about salmon as it descends to the bank of the Kenai River see MP p. 587 “Fishing the Lower Kenai River.” We also went into the Center where the largest salmon caught is on display. 2:03 Out of town and into muskeg ... driving south ... Homer 73 miles. 2:09 Sandy embankment both sides ... land is gently rolling (or gentle hills) and we are away from the mountains. 2:12 The Harding Glacier Range is over to the left beyond the muskeg. 2:15 Crest of a bigger hill. 2:16 Crossing Kasilof River (mile S 109.3 - p. 608) ... anglers in the water ... Kasilof, originally a Russian settlement, was established in 1786 - MP p. 608 - mile S 109. 2:21 Muskeg ... mountains in the distance to the right ... have been seeing side roads, signs to lakes, mailboxes and houses all along the way ... Tustumena Lake. Digging for razor clams - see MP p. 611 mile S 117.4. 2:25 Now fairly close to the water, that is Cook Inlet ... high mountains on the other side - Mount Redoubt, 10,197 feet, Mount Iliamna and Mount Spur. 2:32 - 2:38 Pictures of the mountains, 52 miles away and seen from sea level up! 2:40 - 2:42 Interpretive marker - the mountains across the inlet are all in fly-in country as there are no roads. 2:51 Crossing the Ninilchik River. 2:54 Leaving after pictures of the mountain and the Russian Orthodox Church to drive into the historic village. The church sits on a hill overlooking the village. 2:55 Crossing the Ninilchik River ... there is a cannery here ... What a quaint village! 2:58 Back over the river and turning towards the beach. 3:00 - 3:34 We walked along the beach front, past the cannery, to the mouth of the river. 3:36 Turning back onto the highway ... the Ninilchik High School (A 188.6), Library (A 188.7), General Store (A 188.7) and businesses are strung out along the highway. 3:39 Deep Creek Community and passing a lighthouse to the right. As we drive south adjacent to the coast we get frequent glimpses across Cook Inlet towards the mountains. 3:43 Dead trees - spruce beetle ... houses all along the way ... Sam was reminding us of the time and said we need to be thinking about plans for the day. 3:48 Another picture of the mountain, Mount Iliamna, looking across a green field ... there are many homes along the route ... log houses are particularly nice. 3:56 Crossing Stariski Creek in the bottom of the valley. 3:58 Bald eagle sitting at the top of a tree and looking out to the Inlet. Russian Church - see MP p. 620 mile S 156.7. 4:13 A big wooden billiken standing in a yard ... a profusion of lupines in bloom. 4:15 Snow on the mountains ahead on the other side of Kachemak Bay. 4:18 WELCOME TO HOMER and pulling into a viewpoint. 4:19 - 4:29 Panoramic view of Cook Inlet and Kachemak Bay ... glacier coming down the mountain on the other side of the bay. 4:30 Sign: Entering A Tsunami-Ready Community. Homer is, or seems, a long way from anywhere, but it is very beautiful as we drive down the hill into town ... some lovely homes. 4:34 Best Western Bidarka Inn - probably geared for tourists, but why not? ... 64° ... Wells Fargo. 4:44 Turning onto Campground Road and into Karen Hornaday Campground ... we had to take a detour because of road construction to get here! 5:24 We turned north to drive back to Anchor Point. 5:28 Passing the Viewpoint at which we had stopped on our way into Homer. 5:36 A stream to the right of the road is gurgling along - not dashing! 5:38 Crossing Anchor River ... lots of dead spruce. 5:42 Anchor Point Welcomes You ... turning off AK-1 (Sterling Highway) onto Old Sterling Highway. 5:45 - 5:47 Stopped to look at the map at the corner of Old Sterling Highway and Anchor River (Beach) Road ... see MP p. 620. 5:49 Turning into Slidehole Campground ... drove around to check it out. 5:56 Backed into Site # 22 - more or less mosquito free ... one of the first things I spotted were some Chocolate Lilies, an Alaskan wildflower I never dreamt of seeing - and here they were right by our campsite! Identification The perennial herb Fritillaria camschatcensis (Chocolate Lily or Indian Rice) shows three whorls of lance-shaped leaves and bronze-to-brown flowers in spring (Pojar 1994). The stems reach 16 inches, commonly with one or two flowers but as many as nine. Bulbs have overlapping scales with many small bulblets - resembling rice grains - surrounding the main bulb (Pratt 1997). Habitat Chocolate Lily thrives along coastal parts of the Pacific Northwest, Alaska and into Asia on shorelines, edges of salt marshes and stream banks (Pojar 1994). Uses and Cultivation Coastal Natives eat bublets (Indian Rice) raw, cooked or dried in soups or pounded into flour (Moerman1998). As far as cultivation goes, Chocolate Lily prefers moist sites with hummus soil and light shade. Use in borders or rock beds on dry sites (Kruckeberg 1996). Propagation Bulblets (Indian Rice) from mother bulbs were collected locally in August and October 2005 and then sowed into flats with a media of one part sand (one-inch cover), loam and peat moss. Flats were over-wintered in a cold frame and placed in a shaded bed during the summer. Bulblets will need at least one more growing season before transplanting into beds. Seeds can be fall sown on a media of 1:1:1 sand: loam: peat and lightly covered with 5 mm (1/4 in.) grit, sand or perlite. Seed-grown plants take three years or more to produce flowers. Bulblets are faster and easier. Having set up camp we are leaving to go into Homer. 6:48 Turning right on Old Sterling Highway ... lot more habitation along here than on the main road, some pretty nice homes, too, also small lakes, ponds or sloughs and a few dead trees here as well. As we were leaving I noticed the mountain (probably 10, 016 feet Iliamna) looked as if it was floating in the fog rising off the ocean, and had a mystical appearance. 7:01 Junction with the main highway (AK-1). 7:04 Lots of dead trees on the hillside to the right. HOMER - MP pp.622 - 638. 7:13 Driving past a marsh on the right and a lake on the left. 7:14 Driving along a rocky causeway onto The Spit ... there is a long line of mountains across the bay ... fishing shacks, crab pots. 7:17 Spit starting to widen ... a lot of “funny” boats to the left ... an RV park and motor homes galore ... charter boats ... camping on the beach - doesn’t look very inviting and no wonder Jo didn’t want to camp here! 7:21 A collection of small buildings both sides of the road - gift stores, restaurants, tourist services, boat cruises and fishing trips. 7:23 Road’s end and turning around ... ferry is in. 7:25 A bald eagle landed on top of a light pole ... I love seeing the bald eagles and Sam keeps comparing that to seeing robins in the Lower 48 ... I don’t think I could ever get tired of looking for and watching bald eagles! 7:26 - 7:31 Fisherman’s Market - Pescadero’s, but it was not what we wanted - we were looking for seafood, not Mexican! 7:33 Parked again and this time going for seafood ... Captain Pattie’s Fish House - had a lovely meal, my treat ($86.23). After supper we walked along the boardwalk for a little way, then drove back down The Spit to the Seafarers’ Memorial. The following poem was on a plaque at the memorial. A final resting place for others. Returning to the circle that engulfs all life. Yet how that prosperity can be unforgiving. But some will remain there forever. 9:09 Leaving from the memorial. 9:16 Leaving from boat harbor ... four bald eagles flying overhead and one sitting high up on a tall light pole. 9:23 Leaving after pictures of eagle on dolphin. 9:27 Tsunami Evacuation Route ... back on the road to return from The Spit. 9:31 Two bald eagles standing on the beach by the ocean. 9:32 Back on “terra firma” - actually off the Home spit. 9:34 Float planes on the lake to the right ... 53° ... the sun is still high in the sky! 9:46 Passing Old Sterling Highway (south end) ... the sun is showing itself from behind the clouds. 9:53 A moose with a baby. 9:54 Turning off the highway to drive through Anchor Point - north end of old highway. 9:55 Turning off Old Sterling Highway onto Anchor River (Beach) Road, just after crossing Anchor River. 9:57 Passing the entrance to Slidehole campground to go on down to the beach ... another eagle. ... being here was one of the highlights for the day as I had never seen anything like it - 21 plus eagles on the beach with the seagulls. I took some pictures from near the car, then ventured down onto the beach, but did not want to get too close and disturb all the birds. It was very exciting. 5,509.4 10:30 Back at camp and end of the day. I read in bed until about 11:30 (still daylight) then went to sleep pretty quickly after that. Up at 7 o’clock ... cantaloup and cereal for breakfast ... an eagle flew through the trees and a moose walked through the campground and the site next to us. 8:53 - 9:16 Anchor Point Beach ... some eagles on the beach ... big-wheel tractor taking charter boats out into the water ... tide is out ... boat trailers all line up at the top of the beach and just below the parking lot ... people boarding charter boats before they are towed down to the water. I could spend days here. 9:20 Back on Old Sterling Highway and turning left ... then crossing Anchor River and driving through the village. 9:21 Junction with the main highway. 9:30 Passing the Old Sterling Highway, south end, where we joined this highway last night ... we are driving back into Homer. 9:35 Passing the scenic viewpoint ... it is a gray day, very cloudy, so not nearly as scenic as when it is sunny! Young trees surrounded by 6 foot wire netting to protect them from moose and bears ... 52° in Homer. 9:43 Starting to cross onto The Spit. 9:44 People out clamming ... “Used up all our wows!”. 10:02 Two pictures plus a pit stop as we drive back from The Spit ... two eagles sitting on rocks. 10:05 An eagle sitting on top of a mast. 10:06 Crossing the mud flats ... tide out ... people clamming. 10:07 Off The Spit after passing two interpretive pulloffs. 10:10 Turning right on Lake Street to the business district. 10:18 Crossed lake Street and going southwest on Pioneer. 10:19 Left on main Street. 10:20 Turn left on Homer Bypass road ... I’m not sure what all this was about!!! 10:21 Turning right into Wildlife Refuge. 10:22 - 11:55 Alaska Islands and Ocean Visitor Center - see MP p. 621 mile S173.2 ... one could easily spend a lot longer here. 11:58 - 12:00 The Homer Post Office to photograph the eagle in the stained glass wind. 12:01 On the highway ... 56°. 12:13 Driving east along the ridge with views to both left and right. 12:21 Turning left on Skyline Drive ... some pretty impressive homes. It is no wonder they are scared to death of fire down here with just so many dead trees everywhere. 12:26 - 12:28 Overlooking The Spit ... unique house designs to take advantage of the views. 12:30 T junction - turning left onto a gravel road which dead ends in 8 miles. 12:31 B & B ... Guest House ...there is a lot to see down below at the east end of town. 12:33 Nature Center on the left ... a cache on the right - rather low - maybe a mailbox! ... another B & B ... road deteriorating. 12:42 Leaving after three more pictures, two of glacier and one of The spit. 12:44 A lot of clearing has been done to the right and it looks almost pastoral. 12:50 Back on pavement and turning off Skyline East onto Skyline West. 12:55 Turning left off Skyline West at the junction with Diamond Ridge Road onto West Hill Road ... steep descent ... lots of nice places with gorgeous views. 12:59 T junction - turning right on Sterling Highway. 1:00 On the right a waterwheel which is turning. 1:07 Turnoff for the south end of Old Sterling Highway. 1:15 Anchor Point, but today we are heading for our next destination!. 1:30 An eagle ... I am still excited about seeing them. 1:38 Passing the site of Kenai Peninsula Fair - MP p. 613. 1:39 Turning into Ninilchik as we had decided the previous day to have lunch at the Boardwalk Café on the beach overlooking Cook Inlet. 1:40 Driving along the beachfront. 1:42 - 1:45 Boardwalk Café ... What a disappointment it was to find that for family reasons the restaurant was closed! 1:49 Back at the highway and turning south to look for another place to have lunch. 1:54 - 2:26 Inlet View Lodge Restaurant - had clam chowder and a roll ($6.63). 2:30 Road overlooking Cook Inlet until it turns a corner. Disgorgement of 6 to 8 tour buses! 2:34 Moose on the left. 2:36 Can see Cook Inlet to the left again. 2:51 Seeing the mountains above the muskeg ... lake to the right ... houses on the other side facing towards the road, one with a small plane parked by it ... another shower of rain coming through Tustumena. 3:07 Entering Soldotna ... roadwork. 3:08 Crossing the Kenai River after passing the Visitor Center where we had lunch yesterday ... hard to believe that it was only yesterday - we have packed so much into the intervening time! 3:22 - 3:42 Fred Meyer. 3:43 Back on the highway and turning left. 3:44 Turning right onto Kenai Spur Highway ... 59°. 3:47 Moose on left of road in town. 3:55 Welcome To Kenai ... MP pp. 599 - 606 ... Kenai Central - a big school. 4:00 Turn off the Spur Highway for Mission Avenue. 4:02 - 4:20 Walked around the outside of St. Nicholas Chapel (MP p. 606) and visited Holy Assumption of the Virgin Mary Russian Orthodox Church where there was someone in attendance to answer questions (MP p. 604). 4:38 Passing King Salmon Motel in Soldotna. 4:39 Back at and turning left onto the Sterling Highway. 4:43 - 5:10 Hanson’s Custom Carvings and Gift Shop ... many large wood carvings and the Alaskan Wild Animal carousel, the first and only hand carved carousel. 5:11 Back on the highway. 5:19 Entering Sterling as we retrace our route of yesterday ... 62°. 5:27 - 5:33 House of Knives (Campbell Knives) ... Sam was looking for a replacement for a special knife - unsuccessful! 5:34 Entering Kenai National Wildlife Refuge. 5:39 Crossing East Fork Moose River - creek you can hardly see ... driving east towards the mountains and crossing a wide area of muskeg. Once in the mountains there is a lake to the right ... also seeing snow on the mountains to the south, that is the northern face of the mountains. 5:53 River to the right - back along the Kenai River. 5:56 Where we took our pictures of the fishermen yesterday - there are still a lot of them in the water. I still can’t believe that it was only yesterday that we were here! 5:59 Cooper Landing ... crossing the river. 6:02 Crossing Cooper Creek right before it flows into the Kenai River which is on the left of the road. 6:06 Crossing the Kenai and now it is to our right ... Once you cross the bridge the river becomes a lake ... cabins and cottages along the lakefront. In spite of the cloudy sky the lake looks beautiful with the backdrop of snowy mountain peaks. 6:10 Seward 43 miles ... lots of signs with binoculars to the right for viewing wildlife. 6:14 Cloud is hiding some of the mountain peaks. 5,729.2 6:18 Sign: Hospital 38 miles ... junction with the road from Anchorage ... at this point we left the Sterling Highway (AK-1) and turned south on the Seward Highway (AK-9) to go to Seward. 6:20 Moose Pass 7 miles, Seward 34 miles. 6:21 It is raining again! 6:25 Upper Trail Lake to the left. 6:27 Moose Pass - a really neat place (MP pp. 541 - 542) ... magpie. After this the road descends considerably, but then Seward is on the coast ... just keeps going down. 6:32 Lower Trail Lake to the left, also railway tracks. 6:35 Crossing the train tracks and a little later crossing Ptarmigan Creek. 6:36 Kenai Lake, El. 436 feet (MP p. 542 - mile S 22.7) ... driving along the shoreline. Lots of astilbe flowering ... rushing streams and creeks. 6:42 Turning southwest round the end of the lake and crossing two streams flowing into it. 6:44 Masses of pond lilies blooming. 6:45 More pond lilies to the left ... lots of them back behind the trees on the right ... starting to see glaciers again. 6:51 Bald eagle flying up the valley. 6:55 By now there are a number of houses along the route. 6:57 Passing the turnoff for Exit Glacier. 6:58 Crossing Resurrection River and soon after that getting the first view of the ocean or more correctly Resurrection Bay, an arm of the Gulf of Alaska (which is part of the Pacific Ocean). 6:59 Ferry Terminal 1 mile ... Seward International Airport ... Seward Visitor center. 7:01 Sign: Seward Welcomes You. 7:02 Turning left on Van Buren. 7:05 - 7:09 City Campground (right downtown in Seward Waterfront Park) ... port-o-potties - no like!!!! 7:16 Turning right on Nash Road. 7:20 - 7:25 Alaska Recreation Parks ... we were not impressed! 7:28 Back on the Seward Highway, then at Mile S 2.5, turning into another campground, a municipal camping area with sites on a gravel loop road, but no tables - not to our liking either. 7:32 Back on the highway and turning north. It was decided that we would go to the Primrose USFS (United States Forest Service) Campground - we had been pleased staying in other USFS campgrounds. 7:42 The train line goes under the road. 7:43 The goose (swan) has gone. 7:44 Train line under road again. 7:45 Boardwalk viewpoint overlooking Lily Pad Lake to the right. 7:48 Turning left on Primrose Spur Road. 7:50 A number of private houses, some rather nice ones, along this road. 7:54 We drove around checking out the campground, which is situated on the west side of the southern end of Kenai Lake, and decided on Site # 1. 5,787.2 Backed in and end of the day’s driving - a long day ... unfortunate that none of the other campgrounds were suitable, but it was better here and far more pleasant. The camp fee, $10.00, was only $5.00 with the Golden Age Pass. We quickly set up camp and I made up the beds whilst Jo prepared supper - salad, pork chops and corn. After washing the dishes we went for a short walk to the shore of the lake and back by Primrose Creek where it flowed into Kenai Lake. We were in bed around 10:30 and I read until 11:30. NOTE:As I type my notes I am amazed about all that we did and find myself in a state of excitement, enjoying the trip all over again and am anticipating the pleasure in the days ahead. I didn’t take all the photos I would have liked, but these notes awaken my mind vividly to many of the views. It was cloudy when we got up shortly before 7 o’clock, but by the time we broke camp, there was some blue sky and sunshine. I walked over to the lake which afforded some magnificent views of montain reflected in the still waters. 9:19 Joining Seward Highway and going south. It is interesting how when pieces of vertical shale crack off it forms a ledge which then catches other pieces! 9:30 Blue sky is increasing. 9:34 Two eagles flying overhead. 9:35 Crossing Resurrection River and entering Seward ... glacier to the right. 9:38 - 9:49 Benny Benson memorial - Benny, an orphan, designed the Alaska state flag ... also a 1942 naval anchor. Benny was born in Chignik, a small settlement on the Alaska Peninsula, Oct. 12, 1913. He lost his mother when he was four years old after which his father sent him to the Methodist Jesse Lee Memorial Home, then located at Unalaska in the Aleutian Islands. Later the Home was moved to Seward, where Benny stayed until he was twenty years old. Benny was in the seventh grade at the Jesse Lee Home when he designed the flag. Benny submitted the following text with his design: "The blue field is for the Alaska sky and the for-get-me not, an Alaskan flower. The North Star is for the future state of Alaska, the most northerly in the union. The Dipper is for the Great Bear - symbolizing strength. ... we also walked along the boardwalk. 11:13 - 1:17 Alaska Sea Life Center which is located on the waterfront of Resurrection Bay. M/C $ 14.00 entry, but it was worth it. I saw real live puffins for the first time! The whole place was both enjoyable and interesting as well as being informative and educational. From here we headed out of Seward, saving the boat tour for next time, and hopefully there will be a next time! 1:25 Crossing Resurrection River ... it is becoming cloudy as we go inland. 1:26 Soldotna 91 miles, Anchorage 123 miles, Homer 165 miles. 1:28 Mile S 3.7 ... Turn off for Exit Glacier - 8.4 miles, Kenai Fiords National Park 7.5. The braided bed of the Resurrection River is to our left - rocky bars, stumps, logs scattered across its width. 1:30 A tongue of snow reaching well down the mountainside to the right. 1:31 Another tongue of snow, even lower down on the left ... the valley is closing in but the river bed is still quite wide. 1:33 Entering Chugach National Forest ... some pretty tall trees in here. 1:36 Road on the north bank of the river - not as much water ... can now see the glacier. 1:40 Leaving after pictures of sign, glacier and fireweed. I thought that maybe it was the elevation, but discovered later that the glacier has been receding from this point since the year 1780. 1:43 - 3:52 Exit Glacier. ... We had a picnic lunch (sandwiches which Jo made in the car) at a picnic table by the Visitor center. Then we walked to the Outwash at the base of the glacier - weren’t able to get really close without wading through a stream. outwash (geology and hydrology), deposit of sand and gravel carried by running water from the melting ice of a glacier and laid down in stratified deposits. From here we decided to hike up the other trail to get closer, and being quite a steep climb I told Sam and Jo to go on ahead in case I couldn’t make it! I plugged on and made it to the highest point along the trail which turned out to be a loop and not a there-and-back trail. What an achievement! I walked (climbed) the loop trail to the glacier and was very pleased I had pushed on. 3:54 Back at the 1780 marker ... there were other markers along to trail to the glacier showing how far into the valley the glacier extended at specific times. 3:55 Leaving the park and crossing the river, not the one from the glacier. 3:56 - 4:00 Pullout looking up to the glacier. 4:05 Leaving Chugach Forest and to the right a tongue of snow reaches almost down to the river. 4:10 Junction with the Seward Highway and turning north ... a long climb out of Seward with a passing lane all the way. 4:19 Train tunnel ... road back to one lane each way. 4:23 More ponds with lilies on them to the left and a river to the right. 4:24 Passing a house with the name Snow River Hostel. 4:25 Passing the turnoff for Primrose Campground ... Anchorage 110 miles ... crossing Snow River as it enters Kenai Lake. 4:33 Crossing Trail River and Lower Trail Lake. 4:37 Entering Moose Pass ... road descends into Moose Pass. 4:39 Upper Trail Lake to the right. 4:42 End of Upper Trail Lake ... fish hatchery ... it is raining lightly. 4:47 - 4:54 Someone selling carved wooden bears - Sam bought one of them. 4:56 Turning left on AK-1 for Tern lake. 4:57 - 5:01 Tern Lake ... sat looking out across the lake to see what we could see! 5:02 Back at the junction with AK-9 and turning left on Seward Highway to Anchorage. 5:06 Closure gates ... also speed limit now 65 mph. 5:10 Start of Upper Summit Lake. 5:46 Passing a scenic viewpoint and a pretty deep canyon to the right. 5:51 A glimpse of the deep canyon. 5:52 Passing the turnoff for Hope ... Whittier 33 miles, Girdwood 35 miles, Anchorage 70 miles. 5:53 Waterfall coming out of the cliffs at the right side of the road ... bike and hiking trail, paved, to the left. 6:04 Starting the descent to Turnagain Arm. 6:05 Waterfall to the left ... the peaks ahead still have a lot of snow on them and look magnificent in the sunshine ... a myriad of daisies flowering. 6:07 Turnagain Arm ahead of us. 6:09 Ponds and pond lilies to the right. 6:13 Turning off on Portage-Glacier Road. 6:18 Turning into the Williwaw USFS Campground. 5,907.9 6:22 Our campsite # 46 was vacant, so we took possession for the night and set up camp ... $6.00 (B). 7:06 Leaving to see the tidal bore. 7:15 Junction with the highway and turned right. 7:28 - 7:34 Bore had passed, just, and was not spectacular. 7:39 - 7:55 Stopped again ... tide coming in ... met some BC people from Courtney, Vancouver Is. ... the bore was disappointing. 8:05 Turning off the highway to return to camp. 5,942.7 8:12 End of the day ... late supper: salad and canned tuna with a package of “Helper”. NOTE: We saw miles of cow parsnip in flower along the roadside on our three day trip to the Kenai Peninsula. Astilbe was starting to flower and there were lots of other tiny flowers. The map does not show our actual route through Anchorage - I need to learn more about highlighting routes! 6:15 Had to get up to go to the bathroom ... chilly but sunny morning ... went back to be and to sleep until 7:15. 7:15 Woken up when Sam called out, “Time to get up. I’m hungry.” We had no milk for breakfast or for coffee so had to pack up and find somewhere to eat! With all hands on deck we were able to break camp and be on our way in a little under an hour! 8:19 Turning onto the Seward Highway and heading for Anchorage. 8:22 Passing a passenger train going south. 8:26 Seeing a lot of astilbe this morning along the right side of the road as we drive along the shoreline of Turnagain Arm. 8:31 - 9:21 Breakfast at Girdwood - Alpine Diner and Bakery (M/C $7.50). 9:27 - 9:36 Kobuk Valley Jade Company for me to buy another bracelet (M/C $15.00). 9:41 Back at and turning onto the Seward Highway. 9:42 Lots of dead trees to the right ... the tide is definitely in - “wall to wall” water so to speak ... Cook came up here, but had to turn again, turn again and turn again to get out, hence the name “Turnagain” Arm. 9:44 Waterfalls emerging from the cliffs on the right ... it is an absolutely glorious morning ...still seeing cow parsnip as well as astilbe. 9:57 Waterfall tumbling over high rock cliff. 9:58 Falls Creek ... big waterfall. 9:59 4 sheep on rocks above the road. 10:00 - 10:11 Hope and Sunrise interpretive markers (Mile S 107.9 A 19.1). ... a bald eagle flew overhead ... an extended black Hummer pulling a luggage van went along the highway whilst we were stopped! 10:49 Looking forward over the steering wheel there was an entirely white mountain sitting on the horizon ... when I first saw the mountain it looked to be rising out of the ocean. The other mountains of which I took a picture from the Hope interpretive marker were more to the right of the Arm. 10:55 - 10:58 Marsh with hundreds of birds including kittiwakes and terns. 11:03 Exiting Seward Highway and turning right on Dimond Boulevard. Actually the left turn is for Dimond Blvd. Whilst the right turn is for Abbott Road. 11:06 - 12:06 Fred Meyer - groceries $41.21 (Jo) and beer (Self - M/C $6.49). 12:13 Turned left onto Old Seward highway and left at 88th. 12:15 - 12:52 Jo and I went to Sam’s Club for trail mix - $8.08 + $1.00 for a drink. In the meantime Sam went to a couple of big outdoor sports stores to get a new stuff bag for Jo’s sleeping bag. 1:09 Turn right on Old Seward Highway ... 68°. 1:15 Turn right on Tudor Road. 1:32 Turn left on Tudor Center drive. 1:23 - 2:10 ALASKA NATIVE MEDICAL CENTER I wondered why we had stopped here, that is besides being able to see Mt. McKinley from the parking lot! It was a beautiful building and after going inside the hospital I learned why we were here. The artwork of many native Alaskans was displayed in large windows on each floor as well as small window boxes in the stairwell - like visiting a museum. There was also a gift shop. Several downtown shops sell quality Native Alaskan artwork, but the best buys can be found in the gift shop at the Alaska Native Medical Center, which is open weekdays 10-2 and 11-2 on the first and third Saturday of the month. Leaving the Alaska Native Medical Center we went west on Diplomacy Drive, turned left on Tudor Center Drive and right on Tudor Road. 2:15 Right turn on Lake Otis Parkway. 2:16 36th Ave. - sign to the right for University of Alaska Anchorage. 2:20 Right turn on Debarr Road ... 18° C.
2:24 Left turn on Bragaw Street. 2:25 Left on San Jeronimo Drive ... Anchorage Daily News on the right ... left on Northway Drive and turned around. 2:26 Right on Bragaw Street ... cross over Debarr Road. 2:28 Left on Northern Lights Boulevard (T junction). 2:33 Right on Brittany Drive. 2:34 - 3:46 Visiting with Merrily Kleven, wife of Jo’s cousin, whom I met when I was in Wisconsin last summer. 3:48 Right turn on Northern lights Blvd. 3:50 Left on Muldoon Road ... driving along Muldoon Road there are so many white daisies for a block or two after turning the corner - beautiful ... Pattersen Street lights - masses of white daisies. 3:55 Exiting for the Glenn Highway. 3:57 Leaving Glenn Highway at Arctic Valley Road to return to downtown - not a good exit to have taken. 4:00 Back on the highway to return to Anchorage. 4:04 Boniface Pkwy/Mountain View Drive Exit - Elemdorf AFB. 4:06 Left on Boniface Pkwy and right on Caribou Avenue and into a shopping plaza. 4:07 - 4:20 Parked, but kept the car running ... Jo talked to her son Jake but the phone broke up whilst trying to get LP. 4:22 Back on the highway into town. 4:32 Leaving from McDonald’s after talking to LP - near Airport Heights Drive and mountain View Drive (also 5th Ave). 4:35 Turn left on Glenn Highway, planes going all over which way! 4:38 Passing the exit where we left the highway to talk to Jake and LP. 4:39 Eagle River 10 miles, Palmer 38 miles. 4:40 Passing the exit for Muldoon Road ... speed increased to 65 mph. 4:43 Passing exit for Fort Richardson and Arctic Valley Road, the exit where we originally left the highway to make the phone calls. Now we are finally on our way! 4:48 Exit for Eagle River ... myriad of daisies flowering ... we are munching on beef jerky - no lunch! 4:51 Lots of float planes on a lake to the right ... this is the same road along which we drove when coming into Anchorage six days ago ... Knik Arm comes all the way up here from Cook Inlet. It has been a gorgeous day - fluffy white clouds, Kodak blue sky and sun shining. 5:01 Sign for AK-1 north ... over a rise and Knik Arm can be seen to the left ... (one of the reasons why you have to come all this way to get around the waterway. 5:04 Crossing Knik River - several channels ... (Knik Arm, Knik River, Knik Glacier). 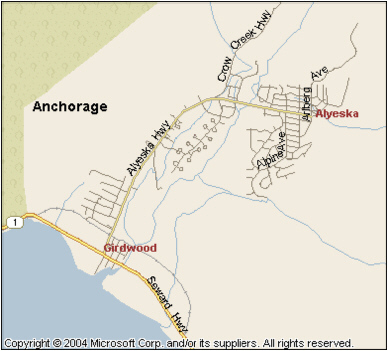 5:08 Road divides, Wasilla north on AK-3, George Parks Highway and Palmer east on AK-1 (Glenn Highway). 6,062.6 5:09 From this point we are starting on new “stuff”. 5:10 Turning into The Homestead RV Park - mile A 36.2 (MP p. 362). 5:11 Stopped to get a campsite - $16.20 (Self - M/C) ... the park was a large one for RVs, but the few tent sites were off to the side and down a hill - washrooms up the hill. 6,063.8 Pulled into campsite and set up camp ... Supper - foil packages with vegetables and ground beef. After supper I took the computer to the bathroom - wrote Jo’s pictures to disk, downloaded all my CF cards and wrote to disk - it really felt good to get that done. The sun was still shining at 11:30! This morning when I had to get up at 4 o’clock to tromp up the hill to the bathroom I found the sky was light and sunrise colors were showing above the mountains peaks. The man in the tent next to us was from New Jersey - he had flown in with his son (a young teenager), rented a car and bought a tent which he will discard when leaving to fly home. Interesting! 6,063.8 9:34 Leave from The Homestead RV Park. 9:40 61° as we drive through Palmer. 9:41 Passing the State Fair Grounds. 9:42 Turning off to see some of Palmer, looking for houses with vegetable gardens ... people in Palmer, est. 1951, take vegetable and flower gardens seriously. 9:49 Junction with Glenn Highway (AK-1). 9:50 A braided river, the Matanuska River, to the right ... the road is winding around, up and down through a valley surrounded by mountains. 10:00 The road is on the left side of the valley looking down on the braided river and across the valley to the mountains ... pink clover along the left side of the road ... the mountain peaks are very rugged, like the teeth of a saw. 10:04 By the river which has a lot more water in it ... daisies in full bloom ... speed limit 55 mph. 10:05 Can now see the mountains to the left and just crossed a rushing turquoise stream - possibly Granite Creek at mile A 62.4. 10:06 On the bank of the river - very wide river bed, braided, but also some fast flowing channels. 10:07 Mile A 64.3 - a distance marker - Glennallen 123 miles, Valdez 240 miles. 10:10 Crossing King River at its confluence with the Matanuska and the road climbs from that point to a point high above the river, then, within two minutes, down again almost to river level. 10:12 Water shimmering in the sunlight. 10:14 Away from the river and driving through forest with some pretty big trees. 10:15 Slide area ... high vertical rock cliffs to the left and the river to the right, then the road darts back into the trees. 10:18 The valley has closed in considerably, the river, narrower, is still below the road. 10:19 Another slide area. The road keeps coming out by the river, then ducking back into the forest ... the river has a lot of water in it now and is fast fkowing. 10:21 Entering Chickaloon ... the Matanuska River is very rough with high waves. 10:23 Mile A 77.7 - Crossing the Chickaloon River as it flows into the Matanuska, and the road climbs high up the mountain. 10:24 The road crests and from here we have a magnificent view below. 10:26 Mile A 80.5 - Distance marker - Glennallen 107 miles, Valdez 243 miles, Tok 243 miles. The road is winding around the mountains literally clinging to the side. The Chugach Mountains are to the south, cloud covering the higher peaks. 10:31 Great view, then down for 1 mile. 10:33 A pretty little calm lake to the right ... maybe not so little! - Long Lake ... The sun is shining in a lovely blue sky, but quite a bank of clouds blanketing the high peaks - 14,000 feet and higher. 10:35 The road is climbing, climbing, then cresting and down again. 10:36 Another lovely lake on the right ... repetition of winding, up and down ... steep cliffs and drop offs with no guard rail. 10:39 A cyclist, with a well loaded bike going our way. 10:40 Starting to see the glacier ahead, the Matanuska Glacier, but there will be many more turns before we get there! 10:42 Brief glimpse of snowy mountains ahead. 10:43 Four mailboxes on the right, also a sign for school bus ... winding down, down, down around the side of the mountain. 10:47 Mile A 96.5 - Crossing Hicks Creek, then up again ... a bad patch of road! 10:48 Mile A 97.5 - Distance marker - Glennallen 90 miles, Valdez 207 miles, Tok 226 miles. 10:49 Passing a pullout where there was a great view of the glacier - going too fast! 10:51 Pulling off for another photo spot - 2 pictures - then back on the road. 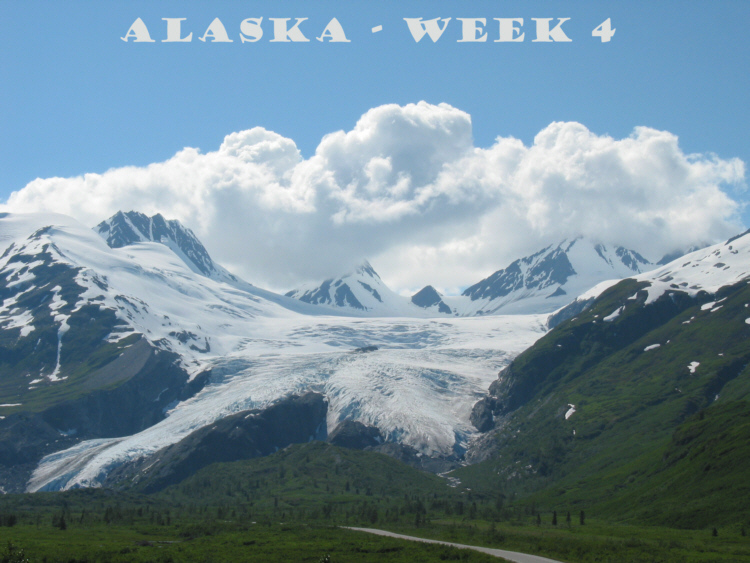 See MP p. 317 Mile A 101 - information about Matanuska Glacier and Mile A 95 Chugach Mountains. 10:53 About 9 mailboxes to the right. 10:54 Passing the Rest Area - again too fast! 10:55 Turning around to return to the Rest Area ... names marked with stones on the embankment. 10:56 Turned off for the Rest Area ... slide area - long slide from top. 10:57 - 11:15 Rest Area. 11:17 Slide and glacier - 2 pictures. 11:18 Looking down on the glacier. 11:20 More pictures of the glacier ... the black is mostly ice with dirt on top of it! Can tell that a lot of people live along here by the many mailboxes. 11:23 Pictures from the moving car ... then road turns away from the glacier ... slide area ... turning into valley. 11:24 Crossing Caribou Creek (Mile A 106.8) - water dirty brown rather than glacier blue. 11:26 Wall for the road ... Matanuska Glacier in valley ... the sun has disappeared behind the clouds. 11:28 Looking back I can still see the glacier ... it is raining in the mountains. 11:29 Mile A 110.9 - Glennallen 77 miles. 11:30 Dark clouds and some blue sky ... the sun is shining again. 11:31 Orange cliffs to the left. 11:31 - 11:36 Mile A 112.8 - Sheep Mountain gypsum and Dall sheep - interpretive markers. 11:37 Passing Sheep Mountain Lodge, with a lot of nice little cabins. 11:39 Welcome to Majestic Valley ... 3 cyclists going our way. 11:41 Picture to the right of cloud rolling over mountain ... a float plane just flew over. 11:42 Now looking over a broad valley - lakes, muskeg, microwave tower on top of hill in the distance ... mountainous ... tundra. 11:43 Knob Lake ... microwave tower on the “knob” (El. 3,000 feet). 11:47 Road is wet because it has been raining, but the sun is shining on us at present. 11:48 Start of a lake to the right - Leila Lake ... an interpretive marker at Mile 120.2 - (see MP p. 314) State Trooper Heck ... Glenn Highway between Mile 128 and Mile 189 is designated as the Trooper Sam A. Heck Memorial Corridor. 11:49 It is raining ... Mile A 122 - Tahneta Pass, El. 3,000 feet. 11:51 Passing tundra-type country ... to the left the hills are green to the top and to the right there are snowy peaks. 11:52 Mile A 128 ... start of the Memorial Corridor. 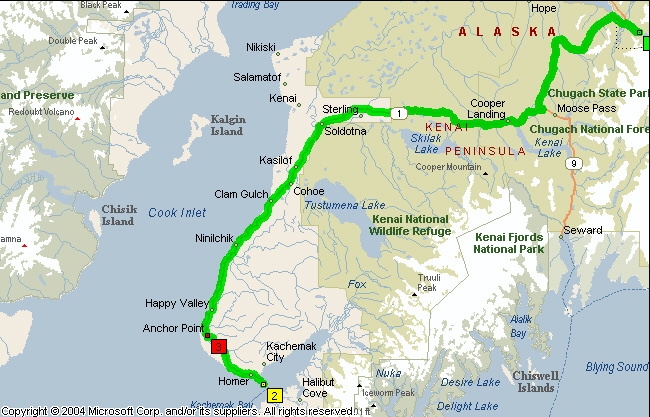 11:53 Mile A 128.5 - Distance marker - Glennallen 58 miles, Valdez 179 miles, Tok 198 miles. 11:54 Eureka Summit, El. 3,322 feet - see MP p. 314 Mile A 129.5 - the divide of 3 major river systems, the Susitna, Matanuska and Copper. 11:55 - 11:58 Pictures of interpretive marker, Nelchina Glacier and storm clouds (also p. 314). 12:03 - 12:04 Pulloff - Picture of Copper valley (we are over the summit). 12:05 Picture towards glacier from car. 12:06 Slide Mountain Cabins (Mile A 135.1) ... sign for a school bus stop ... Caribou signs along the highway - but they cross in October. 12:09 Crossing Little Nelchina River - running heavy and muddy ... frost heaves in road. 12:10 Entering Nelchina, pop. 66, unincorporated - approximately 33 homes between Mile A 138.5 & A 150.4 ... very spread out! ... raining again ... Espresso Java Joint. 12:15 Passing some nice little cabins - vacancy. 12:16 Lakes out to the right behind the trees ... just passing Milepost 145. 12:21 Lots of flowers by the roadside. 12:22 Ryan Lake on our right and quite a valley ahead of us. 12:24 Mile A 150.9 - Distance marker - Glennallen 37 miles, Tok 179 miles. 12:26 Crossing Mendeltna Creek ... Trading Post. 12:29 Tazlina airstrip on the left and lodge with cabins to the right ... Buffalo Lake ... fireweed starting to bloom ... Tazlina Glacier coming up. 12:31 Mile A 159.8 - Distance marker - Glennallen 31 miles ... there are numerous small lakes throughout the area. 12:34 Passing the turnoff for Lake Louise State Recreation Area - 16 miles. Entering Tolsona (for information see MP p. 311 Mile A 170, also Mile A 165.9 for Tolsona Mountain, El. 2,974 feet) ... there are lots of wildflowers blooming but I can’t identify what they are as we drive by. 12:38 Gift shop on the left - Queenie’s - Ivory, diamond willow (Sam bought two diamond willow sticks when we were at Pioneer Park in Fairbanks), local and native crafts (Mile A 163.9). 12:40 Masses of flowers by the edge of the roads both sides ... Mile A 168 - wildflowers. 12:42 Big Lake (Soup Lake ?) To the left. 12:43 - 12:45 Flowers all along the road - pictures. 12:50 Crossing Tolsona Creek - just after a picture from car as driving along. 12:51 A big lake covered in lilies to the right. - Wrangell Mountains (Mt. Wrangell - 14,163 feet) ... wonderful seeing the fireweed ... Glennallen 10 miles. Milepost 177 - a road going into an oil rig. 1:07 Lots of heaving in the road ... some pretty rustic looking buildings. 1:08 Getting closer to the mountains in front of us. 1:10 Reduced speed - 40 mph. 1:11 Copper Valley Library on the left. 1:12 Trans Alaska Pipeline camp on the right ... microwave tower on right ... the town is spread out along the highway. 1:15 Junction with AK-4, the Richardson Highway - Mile A 189 (MP p. 306). ... the Visitor Center has moved from the original log building with the sod roof to a building across the parking lot and adjacent the gas station ... used hood of car to prepare lunch ... pictures of grass and flowers, also poles ... Sam pointed out squashed pick-up camper. 6,212.3 1:59 Copper Valley 14 miles, Valdez 115 miles. 2:00 Tazlina ... some much bigger trees along the road. 2:01 Crest of a hill, and down we go. 2:03 Tazlina gas station and hardware ... crossing Tazlina River, then going uphill ... Copper River is in the valley to our left ... clouds are hiding 12,010 feet high Mt. Drum. 2:07 Mile V 106.5 (p. 471) - Turning off for Wrangell-St. Elias National Park. 2:09 - 3:06 Wrangell-St. Elias NP ... watched film and went through Exhibition Hall ... Sam used the computer to send email. 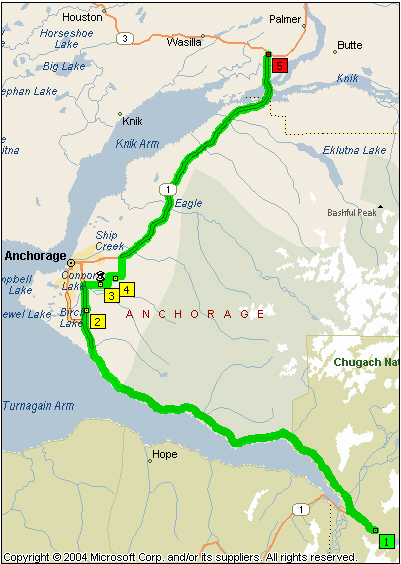 3:07 Back at AK-4, Richardson Highway (runs between Valdez and Fairbanks). 3:11 Eroded cliffs to the left along Copper River. 3:12 First view of the Alaska Pipeline which is to the right of the road ... Mile V 106 - passing the turnoff for Old Richardson Highway which goes through Copper Center - see pp. 469 - 470 for Copper Center Loop. 3:13 Passing the turnoff on the right for Copper River Princess Wilderness Lodge ... MP p. 470. 3:16 Black clouds, blue sky and sunshine ... Mile V 100.2 - the south junction of Old Richardson Highway. 3:24 Edgerton Cutoff 8 miles, Valdez 91.miles.. microwave tower on top of a hill to the right and other communication tower on another hill a bit further down the road. 3:25 Snowy mountains ahead and to the left. 3:26 Pipeline fairly close to the road on the right ... Willow Lake (a big one) to the left - V 87.7 on p. 469. 3:31 Rain nearly stopped and fairer skies ahead. 3:33 Pippin Lake to the right and passing the turnoff for Edgerton Highway to Chitina. 3:35 Valdez 81 miles ... sign: 8% grade and down we go into the valley. 3:36 In the valley and crossing Squirrel Creek first, then Tonsina River ... the ascent doesn’t appear to be as steep. 3:38 River on our right ... basically the road is winding through the river valley. 3:43 We are under a dark cloud again and rain is sprinkling down ... some blue sky ahead and the sun shining on snow high up on the peaks. 3:45 Entering BLM public lands (Mile V 72). 3:50 The valley between the Chugach Mountain Range and the Wrangell-St. Elias Range is becoming narrower. 3:52 Mile V 64.7 - Alyeska Pipeline to the left - Pump Station No. 12 ... microwave tower ... pretty good size installation ... the pipeline is back on our left - don’t know where we crossed it! 3:57 Winding through the mountains we are driving in sunshine under a blue sky. 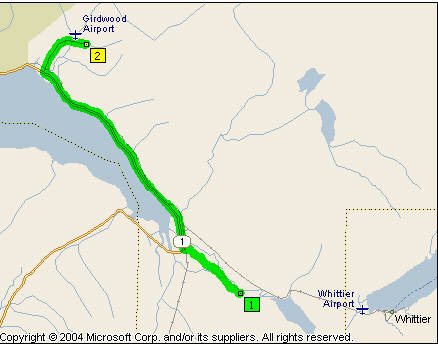 The portion of the Richardson Highway between milepost 10 and milepost 57 is concurrently designated as the Mail Carrier Emil Wegner Memorial Corridor. I have been searching the web for information about Emil Wegner and have come up with a blank! 4:01 Tiekel River to our left ... Tiekel River Lodge. 4:06 Crossing a rushing mountain stream (Squaw Creek). 4:07 Crossing Tiekel River ... tongues of snow coming down the mountain on the right. 4:08 A big rock cutting made for the road. 4:09 Straight stretch of road and a glacier directly in front of us. 4:14 - 4:16 Teikel River and mountains ... crossing Teikel River. 4:18 Rendezvous Lodge and Tavern and crossing Stuart Creek. 4:20 Incredible scenery - mountains, rivers, rocky crags, tongues of snow. 4:22 Braided river to the left and high waterfall to the right. 4:24 Picture from car window ... Valdez 40 miles. 4:25 Glacier high up to the left. 4:26 Water cascading down cliffs on the right in several places ... waterfalls ... so much snow on the mountains ahead. 4:27 Tsaina River is deep down in a canyon as we cross it at Devil’s Elbow ... leaving BLM public lands. 4:29 Picture through front window ... parallel with Tsaina river. 4:33 Road climbing towards glacier ... “What an incredibly beautiful drive!”. 4:35 Cresting the hill ... stopped ... stopped two more times. 4:43 Leaving from near Worthington Glacier State Recreation Site - Worthington Glacier (MP p. 467 Mile V 28.7). 4:45 Worthington Lake on the opposite side of the road, i.e. to the left. 4:46 Picture from car - 27 Mile Glacier. 4:47 Thompson Pass, El. 2,678 feet - MP p. 467 Mile V 26 ... start of steep 7.5 mile descent. 4:49 - 4:53 Pictures by Thompson Pass. 4:55 Signs: Hill - Slow Moving Vehicles ... hairpin bends. 4:55 St. Elias Range is on the left ... from the pass we looked down on this road. 5:00 Crossing Sheep Creek which comes through a very narrow valley to the right. 5:02 Keystone Canyon Rafting outfitter. 5:03 Entering Keystone Canyon ... waterfall winding down the mountainside. 5:04 Crossing Lowe River ... three crossings (MP p. 466) ... it’s a very pretty canyon. 5:05 - 5:07 Bridal Veil Falls (Mile V 13.8) - so high I cant get it all in one picture! 5:08 - 5:09 Horsetail Falls (Mile V 13.4) - opposite side of the canyon wall ... 2 pictures. 5:11 Passing Pack Trail of 1899 ... astilbe, cow parsnip, fireweed. 5:13 Valdez 10 miles (MP p. 462 - Richardson Highway) ... end of (or beginning of) Mail Carrier Emil Wegner Corridor ... habitation and a series of greenhouses. 5:16 The Lowe River has become a wide flat braid - meandering streams through gravel patches. 5:17 Starting to see a number of houses in the valley. 5:18 Astilbe thick to the right. 5:21 Mile V 2.8 - Passing on the left Dayville Road, the road which ends at the gate entrance to Alyeska Marine Terminal, Port Valdez, the terminus of the pipeline which carries oil 800 miles across Alaska from Prudhoe Bay on the Arctic Ocean. The ferry terminal for the Alaska Marine Highway is ahead ... some beautiful homes ... the valley has really opened up like a big basin surrounded by mountains ... paved bike trail to the right. 5:24 Glimpse of the ocean! Actually it is Valdez Arm, another of the arms off Prince William Sound - MP talks about a 13-mile estuary at the head of Valdez Arm! We were at Whittier on Passage Canal which is also off Prince William Sound. 5:26 Container terminal to the left ... road built above surrounding swampy land. Physical mileposts in the MilePost are given from Old Valdez, the Original Valdez Townsite which was destroyed in the Good Friday Earthquake on March 27, 1964. From here it is another 4 miles to present day downtown Valdez. 5:29 Eagle’s Rest RV (M/C $23.00). 6,330.7 Set up camp ... pictures of site ... an eagle flew overhead ... what a time we had setting up the tent! A strong wind was blowing and although a shed afforded some protection we had to use rocks to hold down the ground sheets whilst all three of us struggled with the tent! 6:39 Leaving camp to go for supper. 6:43 - 7:36 Alaska Halibut House ... Jo and Sam treated me to supper - Halibut basket and salad bar ... the fish and chips were wonderful. There's a 35 foot Indian statue on the Doniphan County courthouse lawn in Troy, Kansas. It was carved by sculptor Peter Toth from a burr oak log. when traveling with Michael from St. Louis to Lincoln. The Valdez carving of The Whispering Giant is on the grounds of the Community College located across the street from the restaurant where we ate. From here we drove along Pioneer Drive and turned down Hazelet Avenue. ... fishing boats ... people fishing off the dock ... fish jumping out of the water - too many to count! ... an otter swimming on its back ... I was reminded of fishing days in Australia ... would love to have fished here ... I didn’t want to leave! 8:29 Small boat harbor ... then driving out of town to go to the other side of Valdez Arm and driving back past the marshlands (intertidal wetlands, known locally as “Duck Flats”) there were lots of ducks to be seen. 8:37 Glacier in the distance to the left ... sign for Valdez Glacier. 8:39 Crossing Valdez Glacier Stream, a braided gravel bed. 8:42 Turning off for Trans Alaska Pipeline Terminal (Dayville Road) ... roadwork ahead 5 miles. 8:43 Crossing a wide river, Lowe River, the driving along the waterfront on the south side of the arm. 8:52 Fireboats ... otter on its back. 8:54 Very tall astilbes in flower. 8:58 - 9:02 Allison Point Campground ... pictures looking across the harbor to Valdez. 9:05 Three, no four, five otters. 9:14 Waterfall after eagle pictures. 9:16 Eagle sitting in tree. 9:17 Picture of eagle by the water. 9:20 Leaving after more eagle pictures. 9:26 Back on the Richardson Highway to return to Valdez. 9:34 Passing the our campground. 9:35 Passing Best Western Valdez harbor Inn. 9:36 - 9:52 At the waterfront watching the dancing water display by the fire boats. Theater Conference at the Convention center. Returning to camp ... stopped off for bathroom and watched people cleaning their fish at a fish station provided by the RV Park. 6,358.8 End of the day. One of the things which amazed me was the fact that Valdez is surrounded by mountains and looks to be landlocked. It is hard to believe that it is an ocean port for large oil tankers. I guess that technically it is a fiord. Today is Sam’s and Jo’s 40th wedding anniversary and Sam, who is always the first one up in the morning, had left a card on the dashboard for Jo. What a thoughtful and loving guy. Up and showered by 7:30, then it was breakfast and packing up! I really enjoyed Valdez, not that I haven’t enjoyed everything else, but there was just something about this place. Maybe it was the fact that, in spite of the number of RVs in the campground, the town seemed more natural and less geared to tourism. Whatever it was, I could easily have spent much more time here, and even longer with a fishing licence! 6,358.8 9:15 Leave Eagle’s Rest. We also bought groceries around corner at Safeway (M/C $5.41 - Self) - got a discount with my daughter’s phone number ... Store hours - 4:30 am to 11:00 PM. 9:33 On the road and out of town ... Glennallen 117 miles. 9:38 Turning off for the Valdez Glacier. 9:44 Road closed - roadwork - blasting zone ... so we turned around. 9:51 Passing the Valdez Airport. 9:53 Turning left onto the Richardson Highway ... glaciers can be seen everywhere. 9:54 Crossing Valdez Glacier Creek. 9:56 Passing Dayville Road, the turnoff for the Pipeline Terminal. Leaving Valdez the road, relatively flat, is winding through the valley. the Lowe River is broad and braided with fast flowing channels. 10:08 Pulling off at Horsetail falls to let other traffic past. 10:10 - 10:30 Bridal Veil Falls (V 13.8 - p. 466) ... whilst here we walked back along the road looking for the trail head for the Valdez Goat Trail - see MP p. 466 Mile V 13.8. 10:31 Picture of Keystone Canyon from the car ... then I saw the Old Railway Tunnel - see MP p. 466 Mile V15. 10:32 Crossing Lowe River Bridge No. 2 ... then crossing Lowe River Bridge No. 3. 10:34 Passing Keystone Rafting Outfitters ... After leaving the canyon the road starts its climb to Thompson Pass. 10:41 Start of the elbow turn ... lake to the left of the road with beautiful reflection of mountains in the lake - Blueberry Lake. It is incredible how the road climbs from the valley to above the tree line. 10:43 There are patches of snow at the side of the road ... snow poles. 10:44 Thompson Pass, El. 2,678 feet, embankments of snow on the right ... feels like you are up at 10,000 feet! I noticed some solar panels on the cliffs to the right. 10:47 - 10:49 Pictures looking back to the Pass. 10:51 Turn off for Worthington Glacier State Recreation Area. 10:52 - 11:39 Worthington Glacier ... someone has all the equipment for climbing ... we walked around a small loop trail but did not go out to the glacier this time. We also spent some time in the small visitor center and book store talking to the volunteer there. She was telling us that many of the State parks are being closed and it is very depressing that they will be taken over by private enterprise. I’m kicking myself that I did not buy at least one of the books on Alaska wildflowers recommended by the volunteer! Interesting - she also a had a small vase on the counter with wildflowers in it, including a native orchid. 11:40 Back on the Richardson Highway. 11:42 Passing an active beaver pond to the right ... waterfalls cascading down the steep mountains on the right, one after another. 11:49 Entering BLM public lands. 11:53 End of a series of pictures from the car of sawtooth mountain peaks and a glacier. 11:59 Crossing Stuart Creek (V 45.5). 12:04 Another crossing of the Tiekel River. 12:10 Passing Tiekel River Lodge. 12:18 Pipeline to the right. 12:19 - 12:24 Pump Station No. 12 - see Mile V 64.7 p. 468 ... large building constructed above ground because of permafrost. 12:25 - 12:33 Looking for the boardwalk and interpretive sign written about on p. 468, but we could find nothing! 12:36 The road is now wet so it has rained here and we can see the rain falling out to our left ... of course we are getting closer to the big mountains, Wrangell, 14,163 feet, Sanford, 16,237 feet, Drum, 12,010 feet and Blackburn, 16,390 feet. 12:37 Now it is raining on us ... as well as spruce we have seen a lot of aspen along Richardson Highway. 12:42 Pipeline to the left. 12:46 Raining again and heavier! 12:54 V 82.5 Passing the turnoff for the Edgerton Highway to Chitina, McCarthy and Kennicott ... pipeline to the left. 1:00 - 1:11 Willow Lake Overlook - see MP p. 469, Mile V 87.7. 1:13 House on the lakefront near the end, and other places off the lake. 1:15 Crossing Willow Creek ... MP - thick patches of diamond willow in the woods off the highway (and thick clouds of mosquitoes!) ... What’s new? 1:25 Start of downhill - TRUCKS USE LOW GEAR ... turning onto Old Richardson Hwy. 1:26 Crossing Klutina River ... Old Town of Copper River. 1:32 Passing the cemetery in which the crosses were quite large. 1:33 Houses all throughout ... Glennallen 16 miles. 1:36 T-junction - rejoining the Richardson Highway. 1:37 Turning into Wrangell-St. Elias National Park. ... found a new (new to me) wildflower blooming ... on the way back to the highway we stopped for a picture of the entrance sign. 2:41 Back on Richardson Highway (AK-4) ... the sky is looking very angry. 2:44 Descending into a valley ... helicopter to the right - Copper River Forestry Dept. 2:46 Crossing Tazlina River and going up again. 2:47 Sun shining on part of the closest mountain, Mt. Drum. 2:49 “Hub Of Alaska” ahead. 2:50 Passing the turnoff to Anchorage as we go straight ahead on the Richardson Highway which is also the Glenn Highway (AK-1 and AK-4) ... from here Tok is 139 miles, the Canadian Border 256 miles, Fairbanks 251 miles ... we are now on new road. 2:54 Passing airport, Gulkana airstrip for private aircraft - with about a dozen small planes - 1 pilot per 60 people comes to mind (now on MP p. 305 - Mile A 192.1). 2:57 Rain spots ... the sky has clouded over ... lovely colors along the roadside with a variety of wildflowers. 3:00 The rain seems to be setting in. 3:04 Crossed Gulkana River and more of Mt. Drum is showing in the sunlight ... rafting ... the road parallels the Copper River as far as Chistochina (p. 304 Mile GJ 35.4). 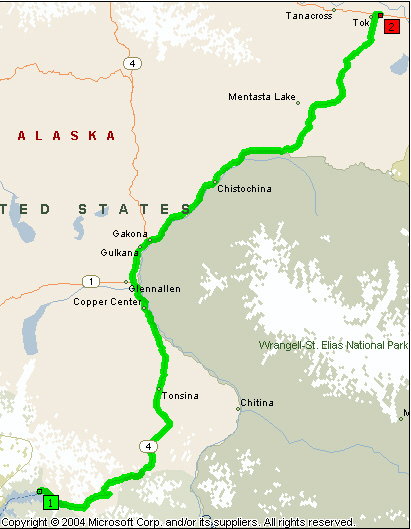 3:06 Gakona ... Junction of Tok Cutoff (AK-1) and Richardson Highway (AK-4) ... Tok 125 miles (Canadian Border 210 miles). 3:08 Pictures of braided river and Mt. Drum ... crossing Gakona River ... Valley of Gakona and Copper Rivers - MP p. 305 ... also Historical marker. 3:12 Climbing up the hill and looking down on the river, Copper River, as well as across to Mt. Drum. 3:13 Still climbing, but the road has flattened somewhat. 3:14 Maybe the crest ... mostly we are traveling at 55 mph. 3:19 Big building to the left of the road - HAARP (High frequency Active Auroral Research Program) - MP p. 304 Mile GJ 11.3 ... patches of gravel along highway. Through gaps in the trees we get glimpses of the mountains to the south ... it is too bad that there is so much cloud hanging over them! 3:40 Mile GJ 28.4, p. 304 -Alaska Road Commission Historical Marker. 3:41 Start of a stretch of gravel road, and it is very rough - road construction 8 miles. 3:48 Driving through Chistochina, pop. 85 (p. 304). 3:52 Posty’s Sinona Creek Trading Post - just after crossing a creek (Sinona Creek). 3:53 Road is being rerouted - new bridges ... crossing Chistochina River Bridge No. 1 ... Crossing Chistochina River Bridge No. 2 ... MP p. 304. 3:55 Passing Chistchina B & B - NO VACANCY ... the town of Chistochina is really spread out ... the end is in sight! 3:58 Back on pavement - What a long 8 miles! Now a lot of frost heaves! 4:02 Two swans on a lake to the right. 4:05 Crossing Indian River ... from somewhere near here the road appears to be following the boundary of Wrangell-St. Elias NP & Preserve for some distance. 4:06 Top of a hill ... permafrost ... road heaving ... quite a valley to the south - Copper River ... Mt. Drum ahead, Mt. Sanford to the left of Mt. Drum. 4:14 Grizzly Lake to the right. 4:16 - 4:20 Cobb Lakes Scenic Viewpoint (p. 303 Mile GJ 56.5) - leg stretch! - Sam has the seat further back and I can’t stretch as much ... my knee is fine most of the time, but once it starts to hurt it just gets progressively worse until I am in agony! 4:21 - 4:23 Scenic Viewpoint and Interpretive Marker. 4:25 Several mailboxes along the road ... Sign: Downhill. 4:26 Gravel patches and long 6% downgrade. 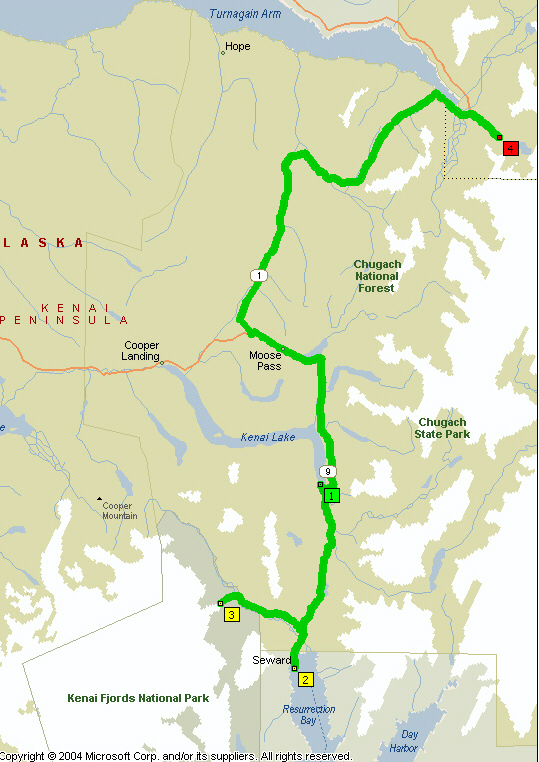 4:27 Mile GJ 59.8 - Another turnoff for Wrangell - Nasbena Road (p. 302). 4:28 At the bottom and crossing Ahtell Creek ... patches of loose gravel continue. 4:30 A couple of small planes and a runway ... roadhouse all closed up. 4:31 Scenic Viewpoint for Noyes Mountain - see Mile GJ 63, p. 303 ... sign, then the road goes downhill again. 4:33 Lots of mailboxes along the road ... crossing Porcupine Creek ... there is a river running to the south of the road. 4:37 Crossing Carlson Creek ... there have been a surprising number of homes along this route so far. 4:38 Another loose gravel patch ... two more of loose gravel ... back into mountains. 4:39 Lake to the right ... not much snow left on these mountains ... the river meanders all through the valley. 4:41 More mailboxes ... patches of loose gravel continue ...lots of loose gravel patches. 4:45 Crossing Slana River, then the Slana Slough ... gravel patches continue. 4:47 Flat valley to the left, a very wide marsh with mountain backdrop. 4:48 We are right in the mountains now - can see snow on north or shaded slopes. 4:50 Mentasta Summit, El. 2,434 feet - Mentasta Mountains - p. 301, Mile GJ 79.4. 4:51 Mile GJ 81 - Turnoff for Mentasta Lake. 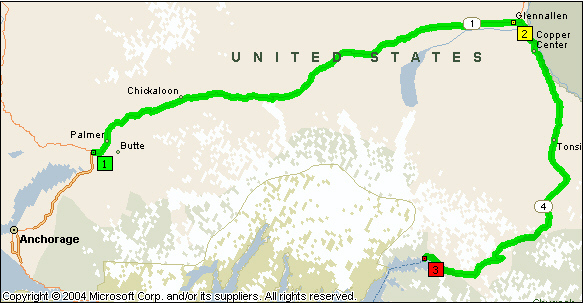 4:53 GJ 82.3 (p. 301) - Distance marker - Tok 40 miles, Canadian Border 136 miles. 4:59 A mother duck and her babies in a pond by the road to the right. 5:02 Little Tok River parallel to the right of the road. 5:08 Rough road and crossing Little Tok River ... Tok River Valley - Mile GJ 103.8. 5:25 Tok 10 miles, Canadian Border 100 miles. 5:33 and start of bike trail on the right. 6,622.5 5:37 Junction with the Alcan, i.e. the Alaska Highway, Canadian Border 93 miles. 5:39 Turned around to get gas. 5:54 Looking for a campsite - Gateway Salmon Bake & RV Park, Mile 1313.1 Alaska Highway - camp fee $13.80 (Jo). 6,625.2 6:05 Parked ... we just got the tent up when the storm broke - dark sky, thunder and lightning and down came the rain, just pelting down. We sat on the beds in the tent and looked at each other! 7:34 When the rained lightened up we made a dash for the car and left to get supper. There was no way we were going to be able to prepare a meal in camp. Besides this was to be our last meal in Alaska and I wanted to treat Sam and Jo. 7:35 Salmon Bake - supper for three $19.95 (Self on M/C) ... Amazing dinner: You chose the main course from the menu listed on the board, gave your name and where you were from, then could go into the dining hall which was set up with long picnic tables covered with red and white plastic cloths. You were then free to help yourself to soup (salmon chowder soup), the salad bar, and iced tea or lemonade. We chose the BBQ halibut, salmon and reindeer sausage combo with beans, which was listed at $18.95 plus $1.00 to share the meal with another person. They only charged me $1.00 extra for the three of us! When “Sam from Nebraska” was called out we got the rest of our meal. The man doing the cooking told Sam that when he saw that the order was to be shared he put bigger pieces of all three items on the BBQ - it was supposed to be 8 oz of each, but Sam said they were more like ¾ - 1 lb, so much so there wasn’t room on the plate for the beans! Jo went back with a soup bowl to get the beans. There was also chocolate pudding and/or peaches for dessert. As I said it was an amazing dinner and we all enjoyed it very much. 6,625.5 End of the day. In the campground we had as neighbors at least six areas where Asians had huge tarpaulins strung up in the trees each covering three tents plus a picnic table and cooking area.